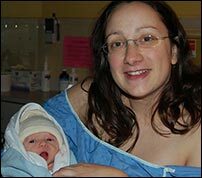 Severine’s mom said she heard laughing in the delivery room... Séverine explains how baby Miro was delivered into a world of laughter! Miro's birth could not have gone better. I truly credit all those years of yoga with Clearlight for helping me get through the pre-epidural phase of labour. I was really pleased to have integrated the breathing fully and naturally. I don't know how I could have dealt with the pain otherwise. The breathing really helped me (I like the "aaaahhhhss" the best). The labour was quite quick too : just under 8 hours. On the morning of the 4th, I went to the doctor's for my routine check-up, and since I was 6 days overdue, we had decided it would be best to induce me on the 5th. So they started the Pitocin at 1 pm, but then I broke my water spontaneously at 3:30 pm. I really felt the baby punch me and I heard a "pop". I told the nurse I thought I was leaking and from that point on, the contractions were every 2 minutes, for 3 1/2 hours. I got an epidural at 7 pm and was dilated at 3 cm. An hour later, they checked me and I was at 10! I couldn't believe them when they told me it was time... I thought I had another 5-6 hours to go. I was in a bit of shock and wasn't quite sure what to think about that. But nature decides for us and I didn't really have a choice. The baby was coming. They could already see him crowning. Since I was no longer in pain, I was laughing a lot... at the craziness of the event. With every laugh, the baby would slide down even more. They told me to relax or the doctor wouldn't have time to be there for the birth. The baby was coming without me pushing!!! When my doctor arrived she said "Why aren't you pushing?? The baby's ready!" - and so I did. Ten minutes later, Miro was out, and it was the most natural thing in the world. I'm sad that it went so fast for one reason : I didn't even notice that my husband pulled him out, cut the cord and placed him on my belly... There was too much going on. My mom was outside the delivery room and said she'd never heard of people giving birth while laughing! It was a truly amazing experience, and one filled with much joy.